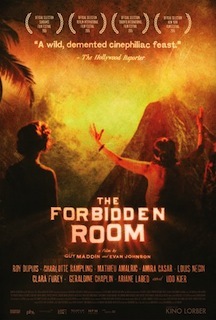 Movie Review: Don't expect anything linear when it comes out of the insubordinate, tortuous mind of the Canadian cult filmmaker Guy Maddin, who in his last sumptuously demented tale, “The Forbidden Room”, had the contribution of the newcomer Evan Johnson as co-writer and co-director. As in the majority of his past works, the film masterfully evokes the black-and-white silent classics and Technicolor fantasies in order to create a layered story that despite the numerous sinister characters and baffling interactions among them, can be summarized as a man desperately looking for a woman. A jocose spirit is present since its very beginning when a man wearing a robe discourses about how to take a bath. This hilarious little dissertation leads us to the central story – Cesare, a courageous woodsman, mysteriously appears aboard of a submarine that is condemned to explode. He’s looking for his kidnaped love, Margot, now an amnesiac prisoner of The Wolf who is kept in a nauseating cave. This main story breaks into multiple inventive fragments that entangle one another with more or less complexity, but which can be easily remembered by their own. They’re all bizarre with no exceptions, yet two sections are particularly mesmerizing: one involving a man identified as The Dead Father, whose mustache is of crucial importance to maintain his family in an emotionally controlled state when he plans to abandon them, and another, in which a woman called Gong had to be subjected to a gut-wrenching re-break of her bones in order to fix them correctly. The casting includes reputable international actors such as Mathieu Amalric, Charlotte Rampling, Udo Kier, Geraldine Chaplin, Maria de Medeiros, Jacques Nolot, Roy Dupuis, Clara Furey, and the recurrent Louis Negin. Near the ending, the inscrutable Mr. Maddin reveals the solution for the perplexing cinema he’s been digging in for more than two decades. He tells us with every word about the stuff his films are made of: dreams / visions / madness. With “The Forbidden Room”, Maddin’s fans will continue to rejoice while a few new followers can be dragged into the cult.